The 30th Atlas 5 rocket began taking shape Monday as United Launch Alliance technicians hoisted the giant first stage onto the mobile launching platform for next month's mission to deploy an ultra-secure U.S. government communications satellite. At the Vertical Integration Facility adjacent to Cape Canaveral's Complex 41 launch pad, the stacking operations got underway to assemble the vehicle for its planned April 27 blastoff carrying the second Advanced Extremely High Frequency spacecraft. Monday's operation featured the first stage, known as the Common Core Booster, driving up the road from the Atlas Spaceflight Operations Center high bay to the 30-story VIF building where workers attached lifting devices. The 106.6-foot-long stage was rotated vertical, then maneuvered into the building and stood upright on the mobile platform. Bronze in color and 12.5 feet in diameter, the stage is equipped with a dual-nozzle RD-180 main engine that will burn kerosene fuel and supercold liquid oxygen during the initial four minutes of flight. In the coming days, three solid-fuel boosters will be mounted to the stage and adapter hardware added atop the stage before the Centaur is attached. The payload and nose cone, already married together, come to the VIF for installation in mid-April to complete the 196-foot-tall vehicle for flight in the Atlas' 531 configuration. Rollout to the launch complex occurs the day before liftoff as the 1.4-million pound platform rides the rail tracks 1,800 feet from the VIF to the pad. 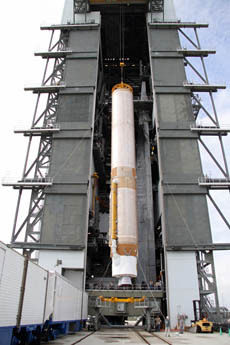 The seven-hour countdown operation begins at 8:08 a.m. EDT on launch day, leading to cryogenic liquid oxygen and liquid hydrogen fueling operations in the early afternoon for a planned blastoff at 3:08 p.m. EDT. The day's launch window stretches two hours. It will be the second teaming between Atlas and the Air Force-led Advanced Extremely High Frequency satellite program. The first launch was conducted successfully in August 2010, hauling the 13,420-pound AEHF 1 into orbit. Heroic efforts by satellite ground controllers, however, were needed over the subsequent 14 months to rescue the craft when debris clogged the main propulsion system and it couldn't be maneuvered as planned. Engineers devised an alternate strategy using smaller engines and the craft's exotic electric thrusters firing more than 500 times to salvage the satellite valued at over $1 billion. Read our previous story on the rescue. 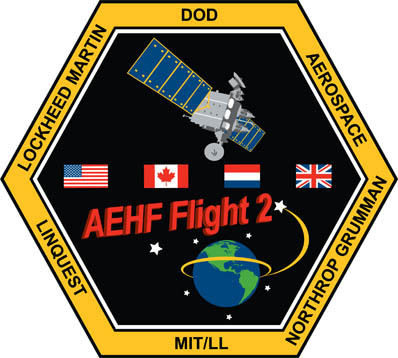 Contractor Lockheed Martin finished its on-orbit testing of AEHF 1 last month, clearing the way for the craft to soon enter service. "I am extremely proud of the team that raised SV-1 to geosynchronous orbit and successfully demonstrated its on-orbit performance," Lockheed Martin's Global Communications Systems vice president and general manager, Kevin Bilger, said in a recent statement. "Their ingenuity, perseverance, and dedication to the mission enabled this critical national asset to stand ready to provide our warfighters around the globe with unprecedented new protected communications capabilities." The Air Force has purchased a fleet of AEHF satellites to replace the heritage MILSTAR constellation as the preeminent path for communications between the president, military commanders and troops on the battlefield. Designers say a single AEHF spacecraft has more capacity than Milstar's five-satellite constellation combined. AEHF birds are sophisticated satellites with highly protected communications, low probability of intercept, resistant to jamming and harden to continue operating in a nuclear war. The AEHF 2 was delivered from the factory in Sunnyvale, California, to the Florida spaceport on Feb. 13 to undergo final preps, the loading of maneuvering fuel and encapsulation within the launch shroud before heading to the Atlas rocket's assembly building. "Delivery of the second AEHF satellite is a significant milestone in the nation's protected communications mission," Bilger also said recently. "Our team is focused on achieving mission success and delivering this much needed capability to the warfighter." Lockheed Martin is under contract to build four AEHF satellites and the Air Force has awarded a contract to begin buying the parts to manufacture two more. 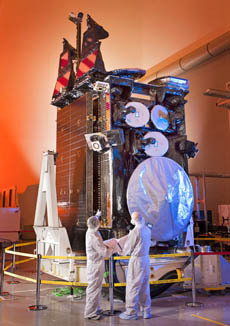 The April 27 launch of AEHF 2 will be the Atlas 5 rocket's second of seven planned flights of 2012, following the Feb. 24 deployment of the Navy's MUOS 1 mobile communications satellite. Five additional launches are slated later in the year including a pair of missions with classified payloads for the National Reconnaissance Office in June and August, two NASA flights with a space physics payload in August and the next Tracking and Data Relay Satellite in December and the Pentagon's X-37B orbital spaceplane taking its third voyage in October. All launches will occur from the Cape except for the early August NRO flight that originates from Vandenberg Air Force Base, California.